Fuji Xerox, one of the world’s leading multifunction office printer brands, has expanded its outreach and services to customers in Malaysia. The company has opened a new official Service Office and Showroom in Seremban, Negeri Sembilan, servicing customers who reside within the state as well as the boundaries of Klang Valley while showcasing the company’s latest office multifunction devices for local businesses and customers. 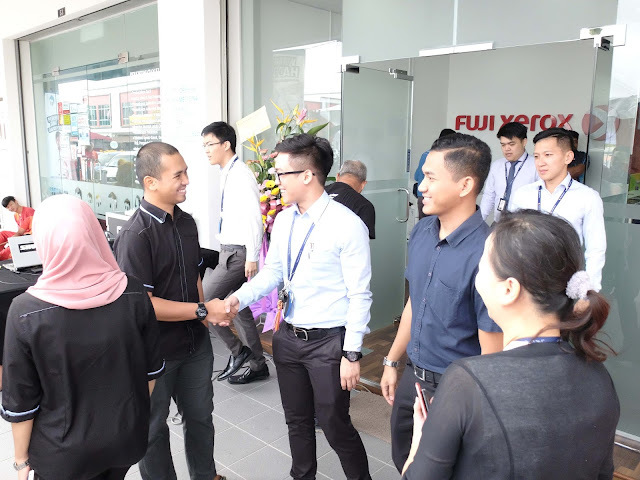 The new Fuji Xerox showroom was launched to great fanfare at Pusat Dagangan Seremban 2 in Dataran Centrio, a new commercial and retail area set in the fast-growing city of Seremban. Yoshio Hanada, the President of Fuji Xerox Malaysia, was present with Fuji Xerox management to officiate the launch of the new Fuji Xerox Service Office and Showroom with a ribbon cutting ceremony and a festive lion dance. Development in the state of Negeri Sembilan is expected to grow exponentially in the coming decades as the Malaysian government recently designated huge tracts of land from Port Dickson to Seremban and Nilai as an economic zone called the Malaysia Vision Valley (MVV). The 30-year development project is touted to be the country’s next world-class economic metropolis designed to complement Klang Valley. The project is expected to create more than 1.38 million jobs. Seremban will also be connected by the 350km Kuala Lumpur-Singapore High-Speed Rail (HSR) network, which is due for completion in 2026. The upcoming railway is expected to bring an economic boon to the city as well as improve its living standards. To date, the city currently has a population of half a million, and the district of Port Dickson is a popular local and foreign tourist destination in the state.